I had so much fun today. Decorating this Halloween table and entertaining our friends for dinner while watching the all American game of 'Baseball'. Being born 50 miles from San Francisco and spending every weekend there in my courting days, I was so happy to see the Giants play in the World Series this year. We had stuffed jalapeno poppers for appetizers. Hot dogs and chile beans. Our friends brought the best cole slaw and for dessert we had ice cream, chocolate candy and madeleines. Now I know why I love to tablescape. It's all about the HUNT! I had a blast finding the decorations for this centerpiece. The mice are running around the house again this year. And some of them have jumped up on the table. The spooky lite houses were on clearance at TM and the decorations on the plates were also on clearance. The items are from last Halloween and I have moved them around the store all year. The little houses are a hoot. The LED lights are so cute shining thru the windows. The table setting consists of everything I have used in other tablescapes. Remember the button dishes? Orange and Black are the traditional colors of Halloween, and also the Giants. That worked out great for my theme tonight. And maybe Good Luck for the home team! The mood is set with flickering candles. Very Hallow for Hallowed Eve. There's Franks house and a scary ghost flying around the other house. I will be celebrating Halloween all week with some great friends in Blogland. Thanks again for being just the greatest followers and friends. This is really a cute table, and I can see that you had fun with it! I am lazy -- with no kids around anymore, I don't do anything like this. So it is fun to see what others do. What a fun table! I love those clear glass plates! Those houses are adorable and I love how you made a tablescape with them. Those mice are having too much fun! I bet this is fun at night with the lights off! 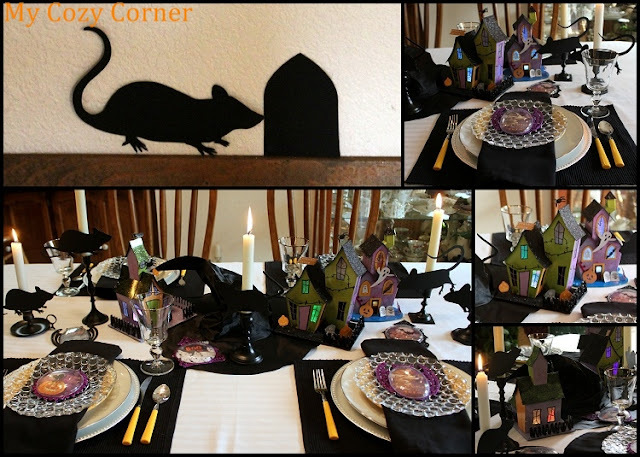 Clever and great for an inexpensive tablescape! The Haunted Houses are my favorite and glad you used them with the lights. Good Halloween tablescape! Your tablescape is lots of fun. I almost got those little houses but I am running out of storage space. Sounds like you had a fun evening with friends! This table is so cute! I love all of it. and the glass bubble dishes look perfect! Thank you for joining TTF. I hope you have a hauntingly good week!